There were many who tried to make quick money from the rock boom in Britain, not just as performers, but managing acts and organising tours - which was where the real money lay. But only one of them has gone down in history: Larry Parnes, or "Mr. Parnes, Shillings and Pence" as he was dubbed by one witty journalist. In some ways, the success of rock'n'roll in Britain is due to the influence of Parnes. He managed so many acts, pushing them, arranging record company auditions and booking the package tours that criss-crossed the country and brought the music to the provinces. 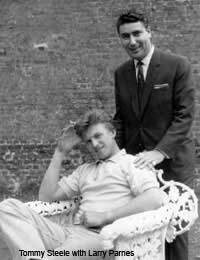 It all began when an associate took him to see Tommy Steele perform in 1956. Sensing the potential, Parnes began managing Steele, and saw the success he achieved almost overnight - making £700 a week, of which Parnes received his percentage. From there he began searching for other talent, soon adding Marty Wilde to his stable. But he did more than manage. He met people at record labels, which helped ease auditions for his acts, and groomed songwriters who could provide material - in other words, he could fulfil the needs of every artist, a one-stop shop for rock'n'roll. Before 1956, Parnes had never been involved with music. Prior to that, after a stint owning clothing shops in Essex, he'd co-owned a bar and invested in a play - a haphazard background for an impresario. He'd taken risks along the way, some of them panning out, others flopping. But he knew a good opening when he saw it, and rock'n'roll was the main chance. Tommy Steele was an immediate hit for Parnes. He understood how to spot star quality, how to make people over, and how to give teens what they wanted. It worked with Wilde, Billy Fury, and to a lesser extent with several others. It was all cosmetic, of course, but the point was that it worked. The press termed him a "svengali," although that probably overstated the case; he simply applied a similar formula to everyone, with varying degrees of success. About the only constant was that Parnes made money. The nature of the business at the time meant he didn't have much major competition, and that translated into plenty of clout. So he could get his acts into record companies, and once the single appeared, on TV, before heading out on a package tour he'd arranged. He was, really, the hub of the wheel, where all the different spokes came together, and poured money into his coffers. Parnes was good, very good indeed, at what he did. But he wasn't perfect. He certainly missed out on two of the biggest opportunities of his time. First he turned down Cliff Richard, who proved to be the biggest star of the 1950s. Then - twice - he passed on the opportunity to represent the Beatles before they became huge. By the mid 1960s, the world of pop had changed tremendously. There was a new style of management in place, with younger characters like Andrew Loog Oldham and Brian Epstein focusing on developing their artists for long careers. Parnes had been more old school, and he knew there was a sea change happening around him. By 1967 he realised things had changed beyond his scope, and retired from music to concentrate on theatre, before giving everything up in 1981, and dying, at the age of 59, in 1989.